© Hussain et al. ; Licensee Bentham Open. Tuberculosis (TB) is considered as a global public health issue but it can be understood as an individual health issue as well. Due to this disease, TB patients not only suffer physically but also psychologically and socially and face severe adverse consequences. Fear of dissemination the illness, helplessness and social stigma related to this ailment, are all plausible causes that lowered self-esteem of the patients and reinforce non-adherence. The purpose of this study was to determine the effect of counselling on treatment adherence and increasing self-esteem of TB patients. This randomized control trial was conducted in Sindh Government Hospital Karachi. A total of 100 newly diagnosed women TB patients were randomly allocated to intervention (n=50) and control (n=50) groups. The data was collected through demographic form and RSES (Rosenberg Self Esteem Scale). Intervention group received counselling with social support during the treatment while the control group received education at the time of registration. Self-esteem was measured and compared before and after the intervention for two groups. Data was analysed through SPSS by using the χ2, and t-test. Results revealed that compared with control group, treatment success rate was 100% among intervention group. The mean self-esteem scores before and after intervention in the intervention group increased from 10.42 to 17.44 showing a significant statistical difference at p <0.05 and p-value is <0.0001. The result of the present study suggests that patients with higher self-esteem tend to adhere better to TB treatment, in comparison to patients with low self-esteem. Therefore, counselling should be the important component of TB treatment to increase patients’ self-esteem which eventually fosters successful treatment outcomes. Keywords: Counselling, Education, Karachi, Self-esteem, TB treatment outcomes, Treatment adherence, Tuberculosis, Women TB patients. Tuberculosis is the second leading cause of death after Human Immune deficiency virus (HIV) . Annually it causes millions of death across the world. Pakistan stands 5th among 22 countries with high burden of TB and 4th with Multi-drug resistant TB among 27 high burden countries. In Pakistan, estimated prevalence of tuberculosis is 342 cases per 100,000 populations and incidence is 275 cases per 100,000 populations. Mortality rate of tuberculosis is 27 deaths per 100,000 people . Poor treatment adherence is also challenging issue and generally tuberculosis cure rate is low in Pakistan. Tuberculosis often leaves its impact on patient’s physical, mental and social life as it is considered a stigmatized disease . Besides this, personal experience, social attitudes and health beliefs eventually affect health behaviours . Patient with TB experience may experience low-self-esteem which makes total burden of disease more challenging to carry. Low self-esteem, depression, anxiety, feelings of hopelessness and worthlessness are highly associated with each other while low self-esteem intensifies susceptibility to the stressors  which leads to difficulty in collaborating and foster reluctance to contribute in the treatment procedures . Self-esteem is an essential concept. It is defined as an individual’s view about themselves and the degree of its approval or refusal. Self-esteem is connected with individual’s readiness to contribute in specific plans and affects the ability of adjusting to a new or different situation . Positive impression of a patient toward herself can directly influence the complaints and behaviours associated to disease. The higher the self-esteem, the more motivated is the patient to involve in self-care behaviours which eventually decreases symptoms and improves patient's attitude . Improving patients’ self-esteem requires time and effort and in this respect, patients’ counselling can play a vital role. Counselling refers to one to one communication between care provider and patients to help patient to form free and informed choice about their life and act on it . The central hypothesis of the current study was that counselling increases treatment adherence and improves self-esteem. Counselling is a process which improves patients’ knowledge about their disease and its curability, enhancing patients’ belief on their own capability to complete treatment, and developing problem-solving skills to overcome non-supportive family and community environments. Through counselling patients recognize their own uniqueness; receive lasting support to carry on the treatment, and to cope with the problems that may jeopardise adherence. The objective of the study was to assess the overall role of counselling on patient’s self-esteem and on treatment outcome. This study was randomized control intervention trial and the population under study comprised 100 newly diagnosed female TB patients (CAT-I) selected from TB and chest Clinic of Sindh Government Hospital, Karachi for a fourteen month period, between January 2014 and February 2015. Fifty patients were randomly allotted in Intervention group while another fifty were assigned in control group. A systematic random sampling strategy on a calendar basis was applied for the current research and patients were not aware about their group allocation. Research design of this study was based on counselling and educational interventions. Patients with any physical and psychological disability were exempted from this study. For enrolling women diagnosed with TB, separate medical file was maintained. Informed consent was also taken from the eligible patients and their relatives. After randomly dividing the two groups data was collected. The data collection form was divided into two-parts. The first part included socio-demographic data i.e. age, marital status and education level. The other part was a standard 10 item Rosenberg self-esteem scale and only Urdu version of the scale was used in accordance to the level of understanding of the study participants and to limit the biases. Responses to each item ranges 0-3 and based on completely agree, agree, disagree, and completely disagree. Item number 1, 3, 4, 7 and 10 are positive items whose scores are 3, 2, 1, 0 and the remaining items are negative items whose scores are reverse. This scale ranges from 0-30 and scores from 15 to 25 are considered normal range; marks below 15 indicate low self-esteem and results above 25 denote high self- esteem. This scale has been extensively used in numerous studies. Though translated version of Rosenberg self-esteem scale is not broadly used in Pakistan but an efficacious administration of Urdu translated version of Rosenberg Self-Esteem scale on Pakistani male and female adolescents  favoured its appropriateness which encouraged the authors to apply translated version of this scale on TB patients. In the current research, the reliability of this scale with 100 participants with Cronbach’s alpha is 72. Subsequently, intervention group was provided individual counselling session with education regarding their treatment. In individual counselling sessions, besides self-esteem, stress and anxiety coping strategies were also taught to the patients. Minimum three counselling sessions were conducted with intervention group. During an intensive phase (initial 2 months of treatment) of the treatment, intervention group had one individual counselling session and then in continuation phase (remaining four to six months of the treatment period) they had two group sessions along with their one or two family members. Each group session had families of 4-6 patients. The first session addressed the hazards of poor adherence, second session covered the side effects of treatment regimen and issues of stigma while in third session patients and their families shared their success stories with other participants. All the counselling sessions were conducted by a psychologist. Control group was provided educational intervention by the doctor (chest specialist). Education included complete information about the treatment, aetiology, duration, side effects of the drugs and consequences of treatment default. Duration of the treatment was six to eight months. After treatment completion, self-esteem was reassessed in both groups to see the effect of interventions. The data was analysed using SPSS software 20 version. Variables i.e. age, intervention/non-intervention groups, marital status, job and educational level were computed by using chi square. Scores on self-esteem before and after the interventions were calculated and compared by paired t-test and P<0.05 was considered as significant (Fig. 1). Flow chart displaying research design. Chi-square test revealed that both the groups were parallel in socio demographic characteristics such as education, job and marital status. Results on the independent t-test indicated no significant difference in age distribution between two groups and mean age of the patient in both the group was 32 (t=-0.097, P>0.05). Table 1 shows the illustration of socio-demographic characteristics of the patients. Demographic characteristics of women patients receiving TB Treatment in intervention and control group. Paired t-test shows statistical significant difference between the mean scores of self-esteem in both groups, before and after the intervention. 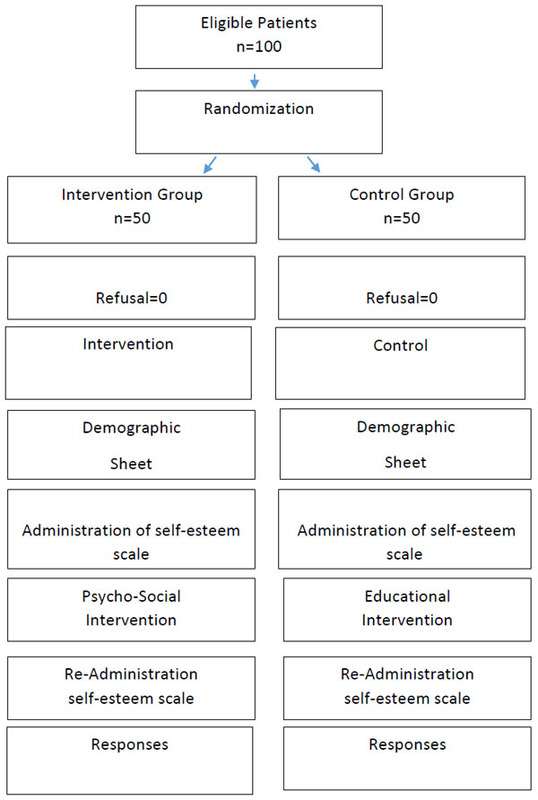 While an independent t-test presents that the mean self-esteem score of both groups has no significant difference before intervention but after the intervention it is significantly different between two groups. Table 2 demonstrates that self-esteem of the intervention group has significantly increased after counselling. Comparisons of mean self- esteem score in intervention and control group. Chi square analysis shows significant difference on treatment outcomes of TB patients. The default rate in the intervention group was 0% while in control group it is 10%. Treatment success rate in intervention group is 100% and in control group 88%. Table 3 shows the comparison of treatment outcomes in both groups. Showing the comparison of treatment outcomes in intervention and control group. This study highlights the importance of counselling for increasing the self-esteem of the patients which eventually resulted in successful treatment outcome. The successful treatment outcome of the current study is higher than the target of WHO (85%). In the present study default rate in the intervention group was 0% while in control group it was 10%. The probable cause of improved self-esteem was counselling provided with social support. It positively affected the treatment outcomes of the patients. The climate of camaraderie and the trust that cultivated in the intervention group led some patients to feel each other as family members. It also enabled them to disclose their psycho-social and marital problems. Many patients manifested their disease as feeling of guilt and self-blame. It was challenging for the TB patients to accept their ailment and its associated treatment. Most of the patients were experiencing social rejection from significant others and as a resort they isolated themselves to hide their disease. Young and unmarried patients were scared of social stigma and continuing social allegations on them. Patient with publicized TB status were considered incompatible for nuptial knots. In this situation, psycho-social support group appeared as the only platform where patients did their catharsis, received empathy and unconditional regard from others. Further, it enabled them to share their complaints about the side effects of the medication. It enhanced the solidarity among patients. They described that listening to other patients’ somatic complaints provided them the opportunity to empathize with each other and tolerate their own problems. Additionally, it strengthened patients bonding with their significant others and helped them to manage their disease and complete the treatment plan successfully. Studies from the massive literature demonstrate that psycho-social interventions improve patients’ emotional adjustment and functional levels [11, 12]. It is also a vital component of comprehensive evaluation of healthcare intervention . Patients also emphasized the significance of social support in their treatment . It is also in congruence with other studies for e.g. study conducted in Senegal on CAT-I TB patients showed that in comparison to control group (16.8%), default rate was decreased up to 5.5% in intervention group receiving counselling interventions . Likewise, a study in India suggests that psychotherapy with motivational interviewing techniques among MDR TB patients without any psychological problem significantly enhanced treatment adherence . Further, social environment also affect patients’ readiness to adhere, particularly when they are suffering from the diseases carrying stigma [17- 20]. Well informed and effectively motivated patients are more likely to adhere to treatment regimen . Findings of the current study are in agreement from the literatures and suggest that for TB treatment holistic approach should be undertaken to boost patients’ mental health, which ultimately improves their somatic health. Further it will improve their self-esteem; minimize the chances of non-adherence and advances health care outcomes. Therefore, these findings explicate the significance of the psycho-social support elements in the medical care system and their connection in increasing patient adherence to TB treatment. This study has some limitations, as study was conducted only on female gender. Therefore, it cannot be assumed that the results are representative of both the genders. The greatest strength of the current study is the design of this study. Group members were not aware about their group distribution. Both the groups were parallel on demographic variables. To minimize the biases only those TB patients were selected for the current study, who were first time diagnosed with TB in their life time. Aside from interventional packages (Psycho-social & Educational) both the groups were delivered free medicines and equivalent health care services throughout the treatment. Self-esteem was improved in the intervention group resulting in high treatment compliance. Positive self-esteem was associated with mental well-being, emotional adjustment and higher rate of adherence in tuberculosis treatment. Therefore, self-esteem augmentation can be an essential component in the prevention and treatment of tuberculosis. In the country like Pakistan, where the health infrastructure is poor; resources are limited and the treatment default rate is high counselling can be an effective tool and could be a valid strategy to improve treatment adherence to control this life threatening disease. On the basis of the findings our hypothesis is accepted. SH and AAM designed the study, SH and ZH participated in statistical analysis and data interpretation. SH wrote the manuscript. All the authors approved the final manuscript. We would like to acknowledge the support of the staff of Sindh Government Hospital Karachi, Pakistan. WHO Global Tuberculosis Report WHO/HTM/TB/201522. 20th ed. Geneva: World Health Organization 2015. [Accessed Nov, 2015]; http://www.who.int/tb/publications/global_report/en/. WHO Global Tuberculosis Report 2014 WHO/HTM/TB/201408. Geneva: World Health Organization 2014. [Accessed Nov, 2015]; http://reliefweb.int/report/world/global-tuberculosis-report-2014. Liefooghe R. The human dimension in TB control: myth or reality? In: Meulemans H, Ed. Tuberculosis in Pakistan: The forgotten plague. Acco Leuven S 1999; pp. 20-2. Pachter LM. Culture and clinical care. Folk illness beliefs and behaviors and their implications for health care delivery. JAMA 1994; 271(9): 690-4. Tarrier N, Khan S, Cater J, Picken A. The subjective consequences of suffering a first episode psychosis: trauma and suicide behaviour. Soc Psychiatry Psychiatr Epidemiol 2007; 42(1): 29-35. Markowitz FE. Modeling processes in recovery from mental illness: relationships between symptoms, life satisfaction, and self-concept. J Health Soc Behav 2001; 42(1): 64-79. Guillon MS, Crocq MA, Bailey PE. The relationship between self-esteem and psychiatric disorders in adolescents. Eur Psychiatry 2003; 18(2): 59-62. Davis L, Kurzban S, Brekke J. Self-esteem as a mediator of the relationship between role functioning and symptoms for individuals with severe mental illness: a prospective analysis of Modified Labeling theory. Schizophr Res 2012; 137(1-3): 185-9. Burn R. Counsels' skills for health professionals. 2nd ed. London 2004; pp. 8-32. Johnston M, Foulkes J, Johnston DW, Pollard B, Gudmundsdottir H. Impact on patients and partners of inpatient and extended cardiac counseling and rehabilitation: a controlled trial. Psychosom Med 1999; 61(2): 225-33. Trzcieniecka-Green A, Steptoe A. The effects of stress management on the quality of life of patients following acute myocardial infarction or coronary bypass surgery. Eur Heart J 1996; 17(11): 1663-70. Barnhoorn F, Adriaanse H. In search of factors responsible for noncompliance among tuberculosis patients in Wardha District, India. Soc Sci Med 1992; 34(3): 291-306. Thiam S, LeFevre AM, Hane F, et al. Effectiveness of a strategy to improve adherence to tuberculosis treatment in a resource-poor setting: a cluster randomized controlled trial. JAMA 2007; 297(4): 380-6. Janmeja AK, Das SK, Bhargava R, Chavan BS. Psychotherapy improves compliance with tuberculosis treatment. Respiration 2005; 72(4): 375-80. Roter DL, Hall JA. Doctors talking with patients, patients talking with doctors: improving communication in medical visits. Westport: Auburn House 1992. Bensing JM, Kerssens JJ, van der Pasch M. Patient-directed gaze as a tool for discovering and handling psychosocial problems in general practice. J Nonverbal Behav 1995; 19: 223-42. Kadam UT, Croft P, McLeod J, Hutchinson M. A qualitative study of patients’ views on anxiety and depression. Br J Gen Pract 2001; 51(466): 375-80. Sirey JA, Bruce ML, Alexopoulos GS, Perlick DA, Friedman SJ, Meyers BS. Stigma as a barrier to recovery: Perceived stigma and patient-rated severity of illness as predictors of antidepressant drug adherence. Psychiatr Serv 2001; 52(12): 1615-20. Squier RW. A model of empathic understanding and adherence to treatment regimens in practitioner-patient relationships. Soc Sci Med 1990; 30(3): 325-39.